We begin with the rubber dinghies - way southern- for a way of 15 miles (45 thin roughly). 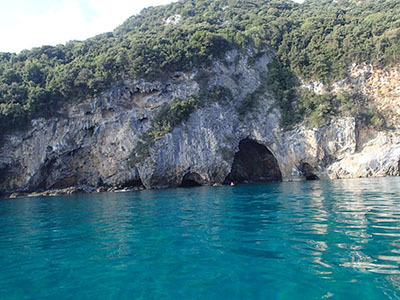 We pass beautiful creeks and coasts of Eastern mountainous volumes of Montenegro and V. Pelion. We will visit the Caves of Venetian in landscape of wild beauty, abundant and untouched still from human interventions, for few only that they dare to reach them and they admire nature’s dynamic creation. In distance of 2 miles we will enjoy our swimming in the solitary beach of monastery Flampouri where we will also have lunch. Crystal waters, flashy blue-green reflections and wild beauty are certain from the words that characterize the marine caves of Venetian. We will explore these works of nature with the ship in the Aegea’s Cave where according to the fable took place the marriage of Achilles parents. Includes: skipper, gasoline, necessary equipment, fruits and water.